With all the anatomy I’ve studied and the continuing education I participate in, you would think I’d have had about enough of anatomy and kinesiology or that I would already “know it all.” Wrong on both counts! I am a firm believer in continuing education no matter what your field (I wrote a blog post about this) and there really is so much to learn in my field that I will never stop studying. I spend at least one hour every day learning about new exercises, methodology, nutrition and psychology (as it pertains to behavior, motivation and compliance.) Even though I think of myself as an “expert,” the more I know, as they say, the more I know I don’t know. I finally got around to reading it this month. Wow! What a unique book. 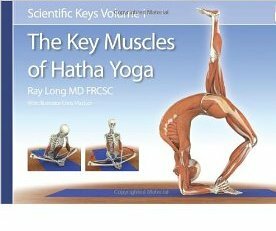 The Key Muscles of Hatha Yoga, Volume I by Ray Long, MD is a collection of beautiful and amazing illustrations (and instruction) that nearly leap off the page and firmly shake your hand. There is also a good discussion of biomechanics and kinesiology in this book that makes it a good refresher or, if you’re new to exercise science, a terrific explanation of what muscles are being used in what way during certain Yoga poses. This is much more than a reference book. But let me just say, The Key Muscles of Hatha Yoga, Volume I is a wonderful learning tool for ANY form of exercise because muscles, bones, fascia and connective tissue do not change because you're doing a different form of exercise. The study of how the body moves through space and time is basic to all forms of exercise-even if the way we work them is slightly different. It's also true that when you integrate multiple training methods, you create a much more functional body and one that is less prone to overuse injuries. Flexibility then, is not just limited to the body.